Five police officers died following a sniper attack during a Black Lives Matter protest in Dallas, Texas. During an ensuing standoff, Dallas Police Chief David Brown said suspect Micah Xavier Johnson, 25, told negotiators he “wanted to hurt white people” and was upset at recent shootings in Baton Rouge, Louisiana and St. Paul, Minnesota. Johnson died at the standoff scene after police used a robotic explosive device. 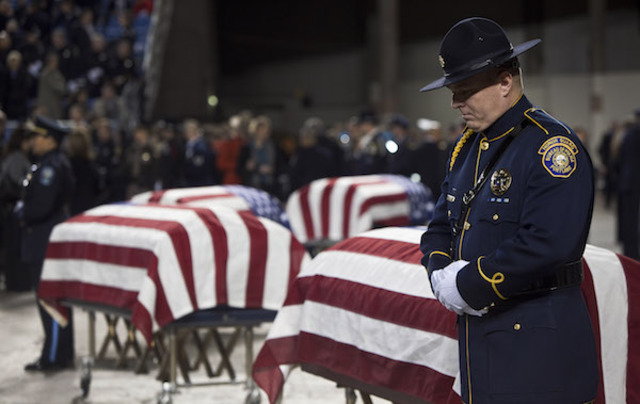 This incident was the deadliest day for law enforcement since the September 11, 2001 terrorist attacks. New York City Police Department Officers Wenjian Liu and Rafael Ramos died when a gunman approached their parked police car and shot them multiple times through the passenger-side window. Officials said gunman Ismaaiyl Brinsley, 28, traveled from Baltimore looking to kill police officers in retaliation for two high-profile deaths of black men tied to police: Eric Garner in New York City and Michael Brown in Ferguson, Missouri. The New York Times reported Brinsley sent threats to officials, but they arrived too late to prevent the killings. Brinsley later shot himself with the same gun he used to kill the officers. Four police officers were in the Forza Coffee Co. shop just before their shifts began. At around 8:15 a.m. PST, Maurice Clemmons, 37, walked into the shop and shot them. The gunman fled the scene, but died on Dec. 1, 2009 after being shot by a Seattle police officer following a two-day manhunt. Clemmons told family members at a Thanksgiving gathering that he planned to murder police because of numerous legal problems he encountered over the years, including a 10-year prison sentence in Arkansas from multiple offenses that was commuted by then-Gov. Mike Huckabee. What started out as a call for a domestic disturbance at a local residence became a murder scene when 22-year-old Richard Poplawski shot and killed three responding officers. Poplawski’s mother had called 911 to have her son removed from the home after an argument When Officers Paul Sciullo, 37, and Stephen Mayhle, 29, responded, her son was “lying in wait” and shot both men in the head. A third officer, Eric Kelly, 41, arrived on the scene after hearing a radio call on his way home. Poplawski shot Kelly as he attempted to help his fellow officers. Poplawski was arrested, convicted and sentenced to death by lethal injection in May 2012 . Two separate shootings by the same person took the lives of four officers. Lovelle Mixon, wanted on a parole violation and later connected by DNA to two rapes earlier on March 21, first fatally shot two Oakland police officers during a traffic stop. According to the Los Angeles Times , Mixon fled to his sister’s home, where a SWAT team eventually attempted to take him into custody. During the raid, Mixon shot and killed two more officers while hiding in a closet. Mixon was killed during the ensuing gun fight. 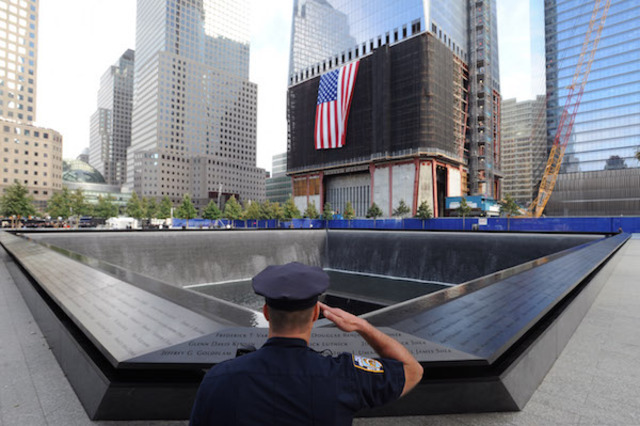 The terrorist attacks on September 11 marked the deadliest day in modern history for law enforcement officers. At the World Trade Center attack site, 60 police officers from the New York Port Authority, the New York Police Department and the New Jersey Police Department died as they responded to the scene where two airplanes intentionally crashed into the Twin Towers. Many of these officers went into the buildings to help with evacuations and died in the ensuing collapse. The bombing of the Alfred P. Murrah Federal Building in Oklahoma City killed a total of 168 people, including eight law enforcement officers . Four were members of United States Secret Service, two were U.S. Customs Service agents, one was a U.S. Drug Enforcement Administration agent and one was a member of the U.S. Department of Housing and Urban Development. Timothy McVeigh and Terry Nichols planned the attack, which used a rented Ryder truck filled with explosives as the bomb. Both were eventually arrested. McVeigh was convicted and sentenced to death . He died by lethal injection on June 11, 2001. Nichols continues to serve a life sentence without the possibility of parole. California Highway Patrol officers Walt Frago and Roger Gore performed a traffic stop at a restaurant after following a car believed to be carrying suspects from a highway incident earlier in the day. They called for backup from other officers on their radio. Gore asked the two men in the car to get out. As the driver, Bobby Augusta Davis, climbed out of his seat, passenger Jack Twinning pulled out a shotgun and killed Officer Fargo. Davis then fatally shot Officer Gore. Two more officers quickly arrived on the scene. Officers George Alleyn and James Pence Jr. jumped out of their car and engaged in a gunfight with the suspects. Both officers were killed at the scene. Davis and Twinning fled and took cover in a house. Police tracked them down and Twinning committed suicide with Officer Frago’s gun, while Davis was captured. He was convicted and received the death penalty, which was ultimately commuted to four life sentences. In August 2009, Davis was found dead in his cell at Kern Valley State Prison from an apparent suicide.